The update for All versions is available. I've finished there some features that I planed to do during this year but did not have a chance to finish them. BUT THE PROGRAM WILL ASK YOU TO CLOSER TS PRIOR RUNNING BACKUP UTILITY.Â This is important, because some files are not available while TS is active. 2) Changes in astro based charting tolls like planetary equidistant lines, planetary steps etc. 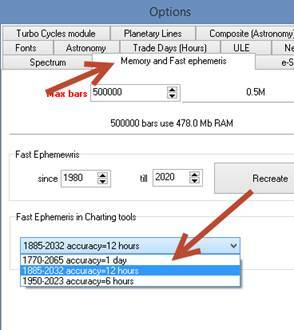 You can define interval and accuracy for ephemeris that are used to calculate these charting tools. BTW, you can extend the analyzed interval (questions from Stefano and Antonio). 3) Alon, I recommend to save all Natal files into c:\TimingSolution\Natals\ folder. Also please download and install TS Utilities in User Area. 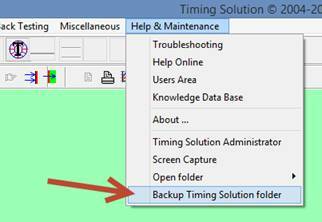 The new backup utility there backups ALL files in c:\TimingSolution\Natals\ folder.